Jump to the intro and discussion. 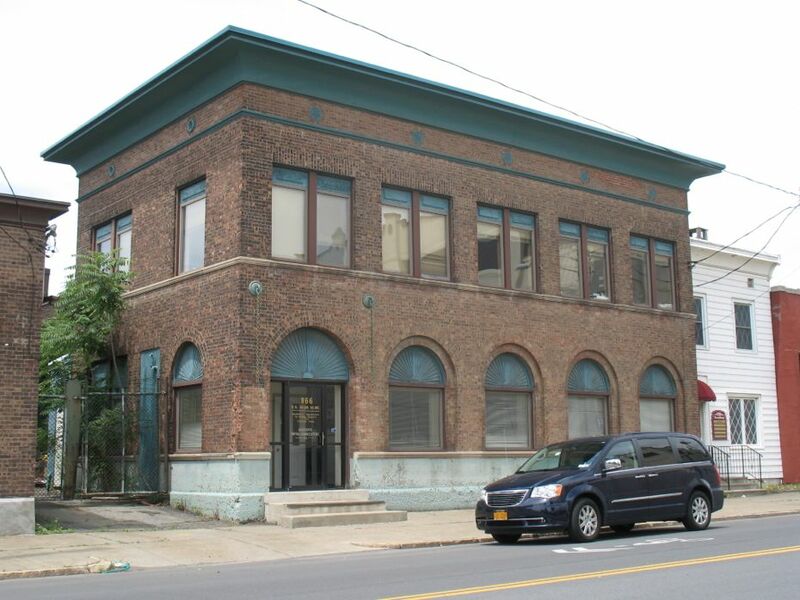 960 Broadway -- the Rodger's Liquor Building -- is one of the focus buildings for the Preservation League of New York's Industrial Heritage Reuse Project. 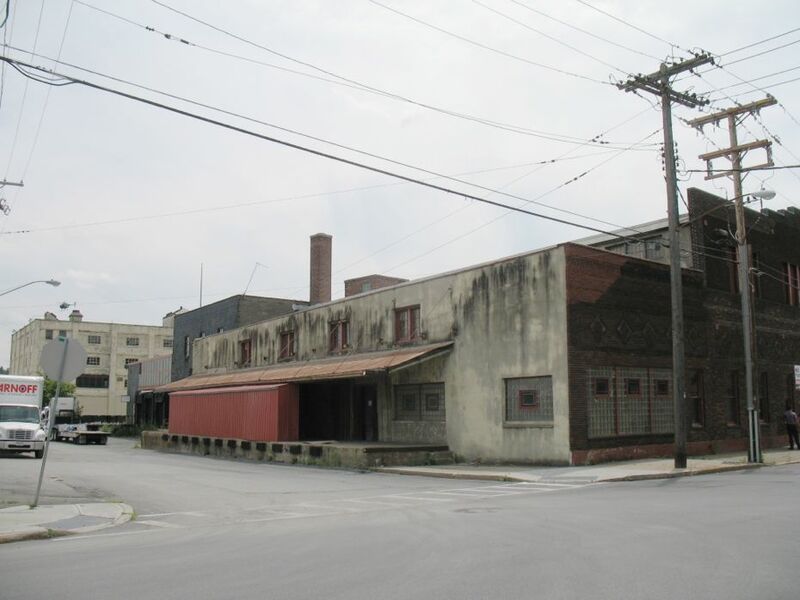 Owner Bill Barber is interested in converting the building to a restaurant on the first floor, with residential upstairs. You don't have imagine very hard to see how the building might work for that. Moving north up Broadway. This building has some nice details. 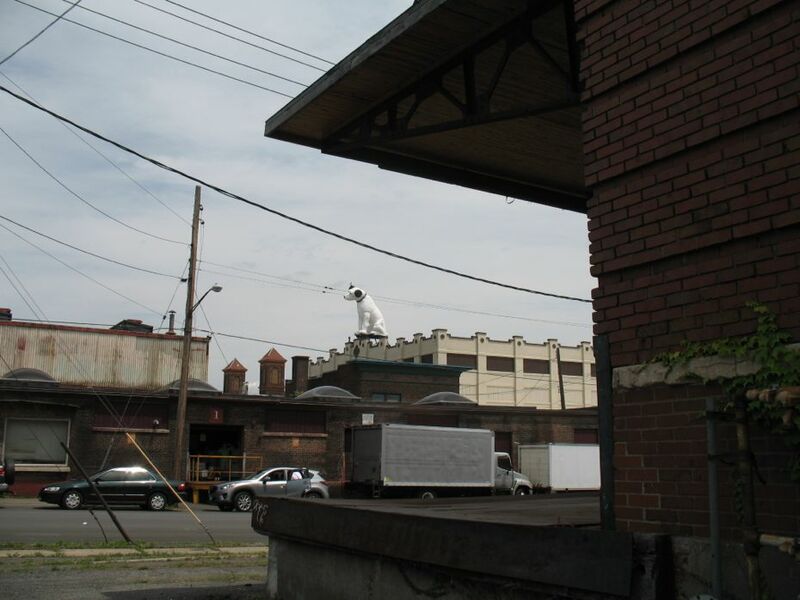 The warehouse district's most famous resident. 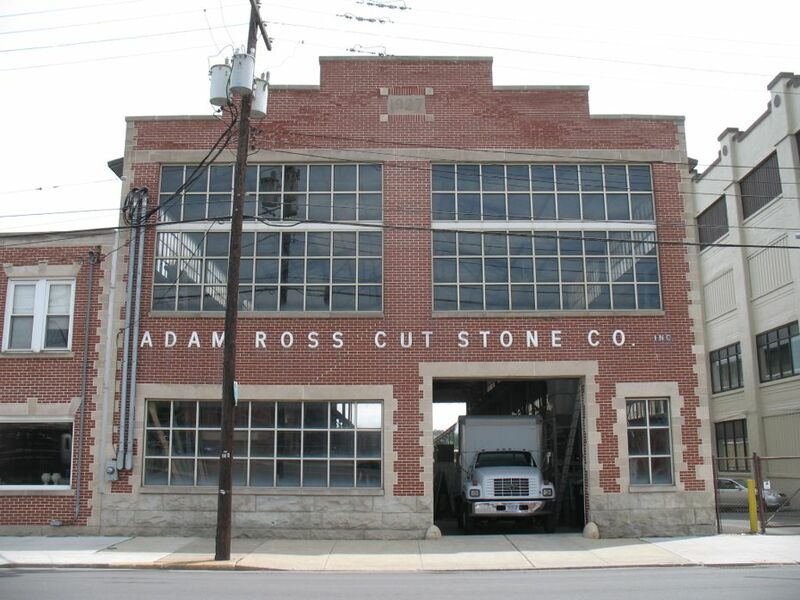 Adam Ross Cut Stone is one of the city's oldest businesses, dating back to the 19th century. It also has a really cool building, loaded with windows. The Argus Press building, which is just about a century old. 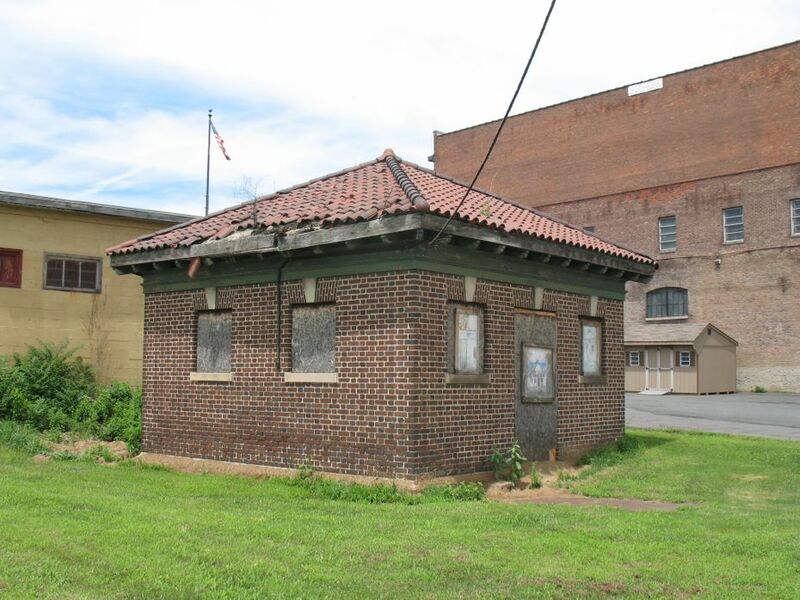 Historic Albany has listed it among the city's most endangered historic buildings. Looking back south on Broadway. Jumping up to North Pearl, and a look up Tivoli Street. 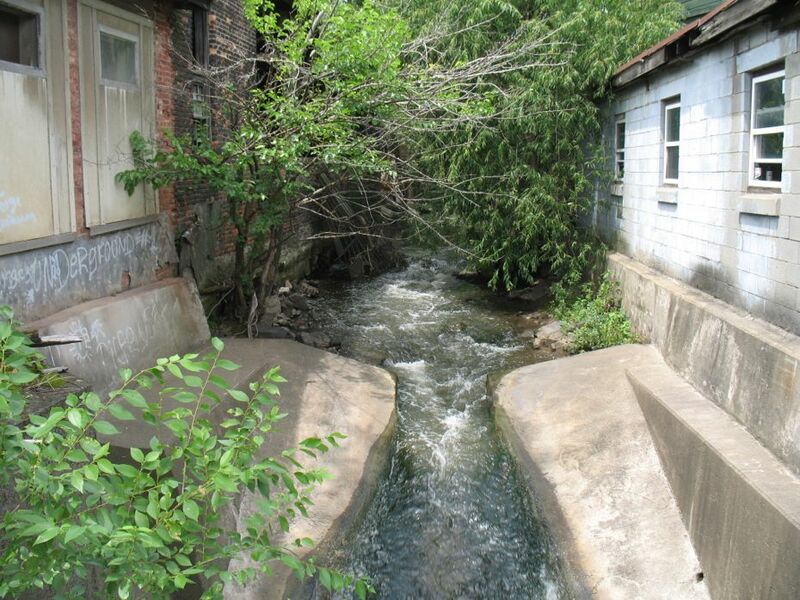 This waterway is tucked between Albany Spring Service Building and another building. We think it's the Patroon Creek, right before being sent underground (it later surfaces at the Hudson River). From North Pearl looking east across Broadway. 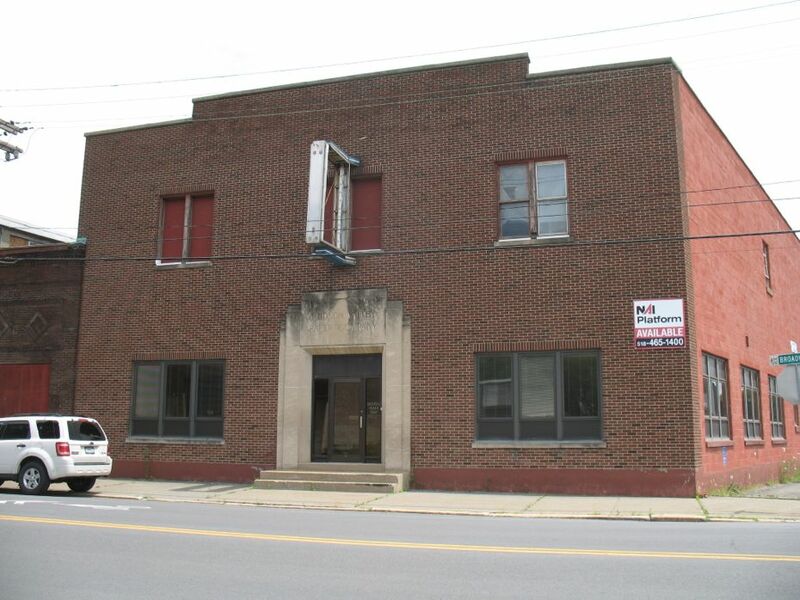 This is the building across the street from the Rodger's Liquor Building. It looks like it could beâ€¦ something. 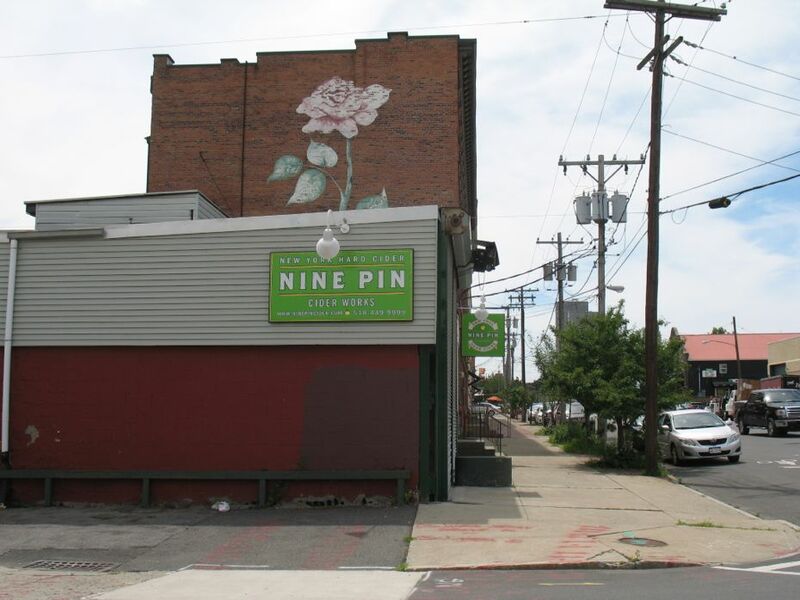 The Nine Pin Cider Works started up last year at the corner of Broadway and Thacher Street. 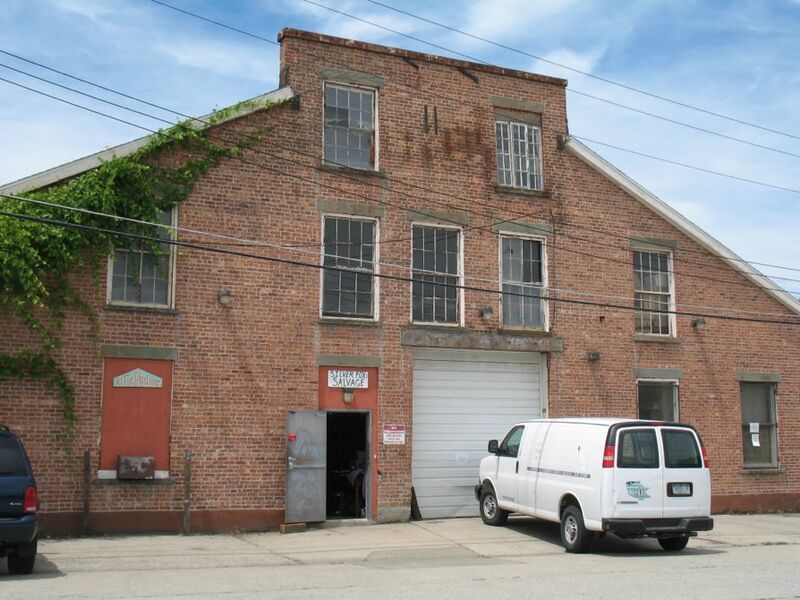 The space had formerly been occupied by a marble cutting business. Common Place, which is more like an alley than anything. 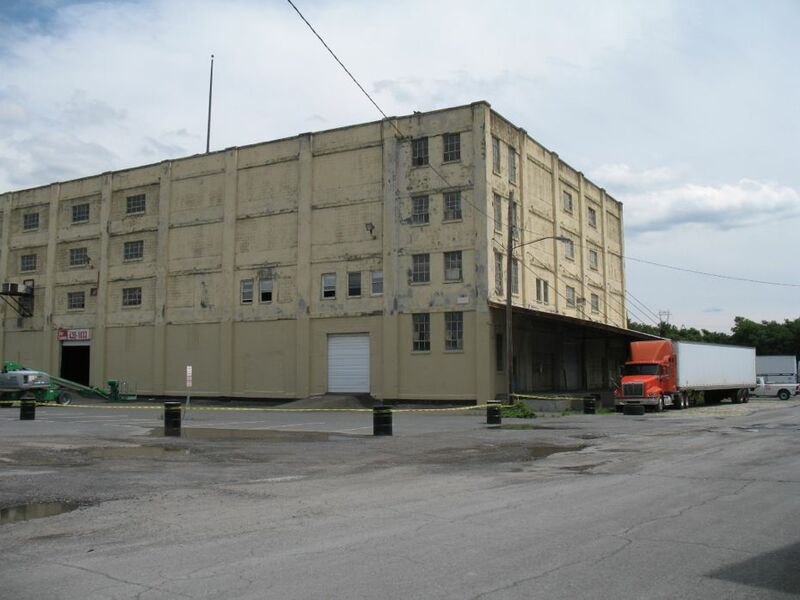 This was the building that had been proposed as a concert venue. 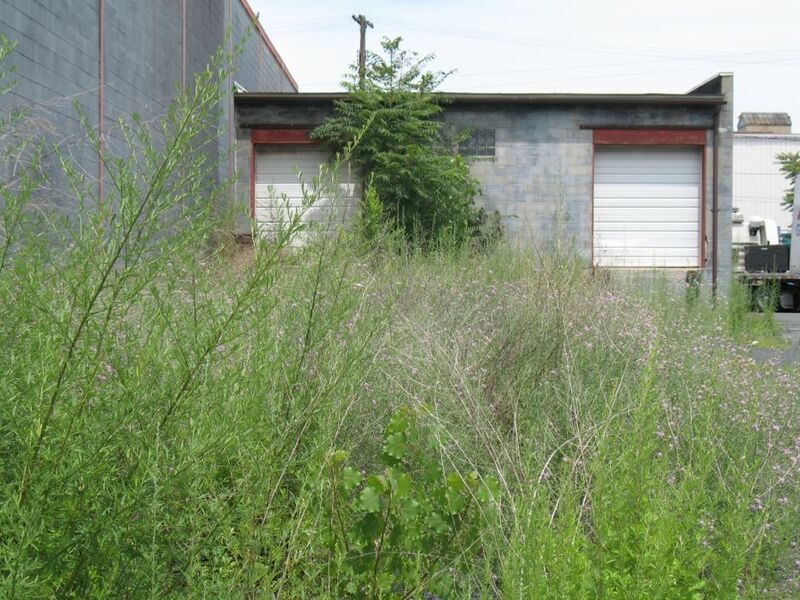 The city's BZA denied the variance necessary. Now back up toward Broadway on North Ferry and a string of buildings you probably recognize. A bunch have already been turned into offices and restaurants. 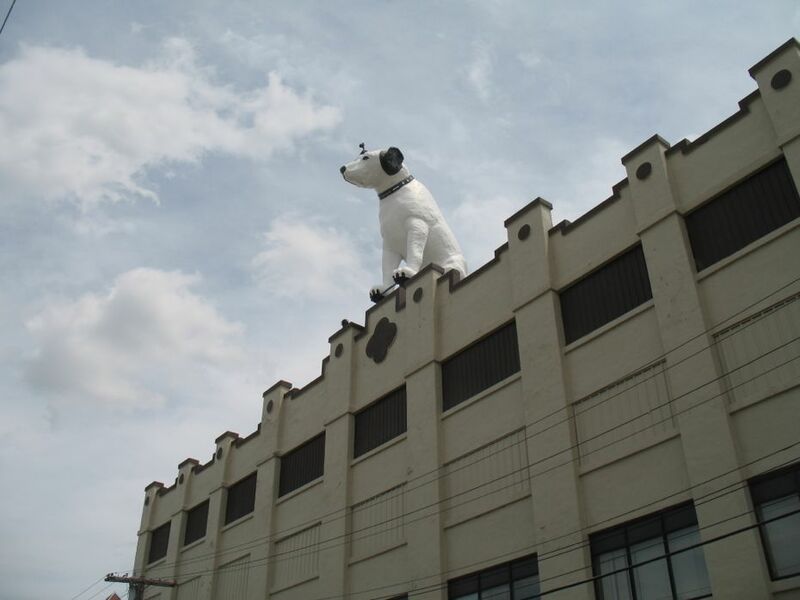 Can you imagine Nipper as a neighbor? 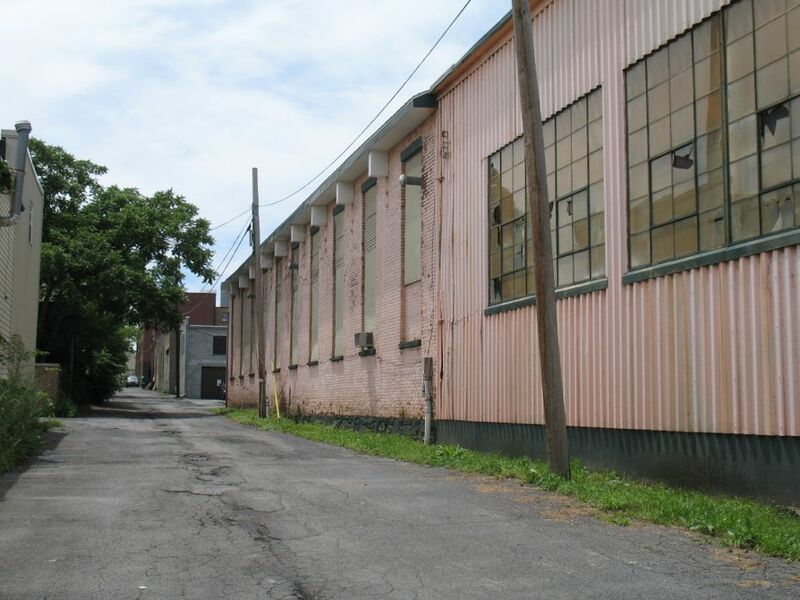 The recently announced project to develop plans for reusing a handful of historic industrial buildings around the Capital Region -- and specifically, a very early plan for a restaurant/residential conversion on Broadway in Albany -- got us thinking (again) about Albany's warehouse district. It's one of those areas that might necessarily jump out as a place with notable buildings, but there is interesting architecture there. And the neighborhood might have a lot of potential. After the jump, a photo tour -- and a few thoughts on that potential. 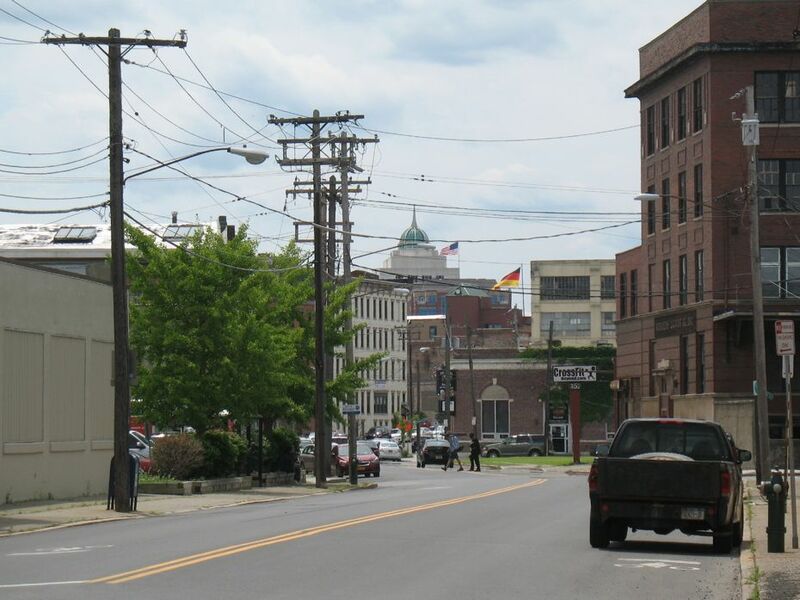 It's the area in north Albany, along Broadway and North Pearl, roughly from the railroad overpass on Broadway (south end) to the I-90 overpass (north end). 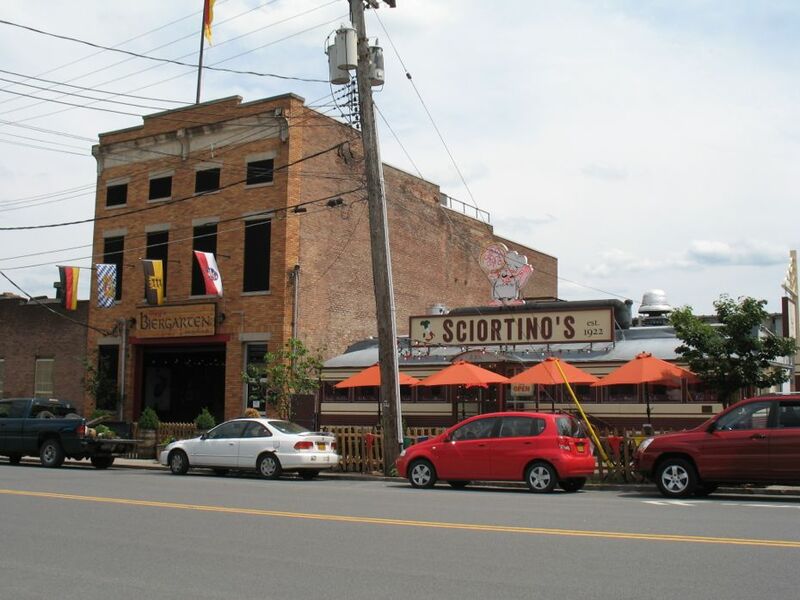 As you know, there's already a strip of offices and restaurants in this neighborhood: Wolff's, Sciortino's, Stout, Barrel Saloon, Nine Pin, as well as a few office buildings. 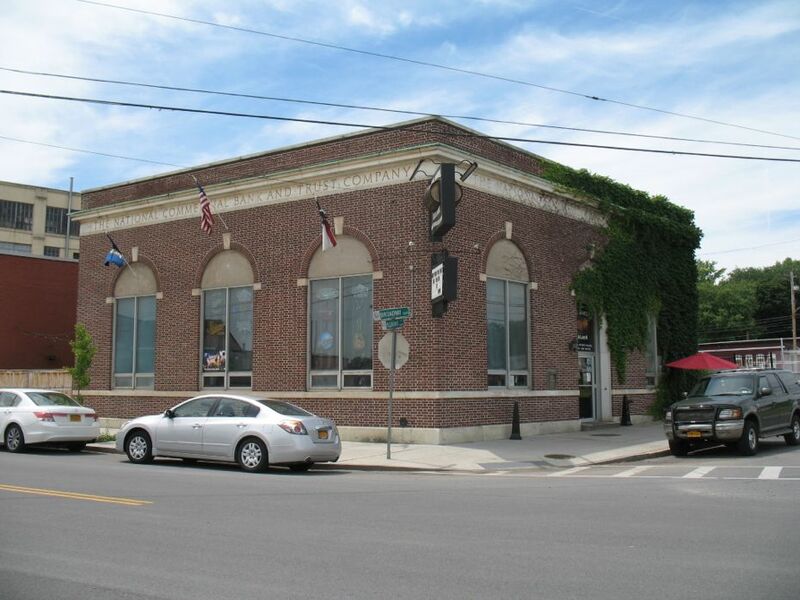 And Druthers is planning a brewery a few blocks up Broadway. That seems to have people eyeing this neighborhood for further development. 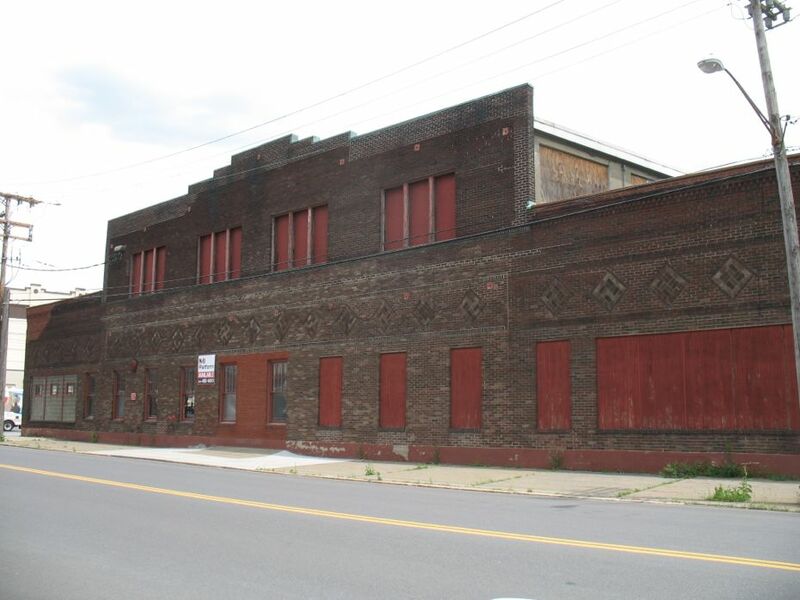 The owner of 960 Broadway -- the Rodger's Liquor Building, a block north of Wolff's strip on Broadway -- told us the restaurant development already in place made him optimistic about converting the building to restaurant/residential. 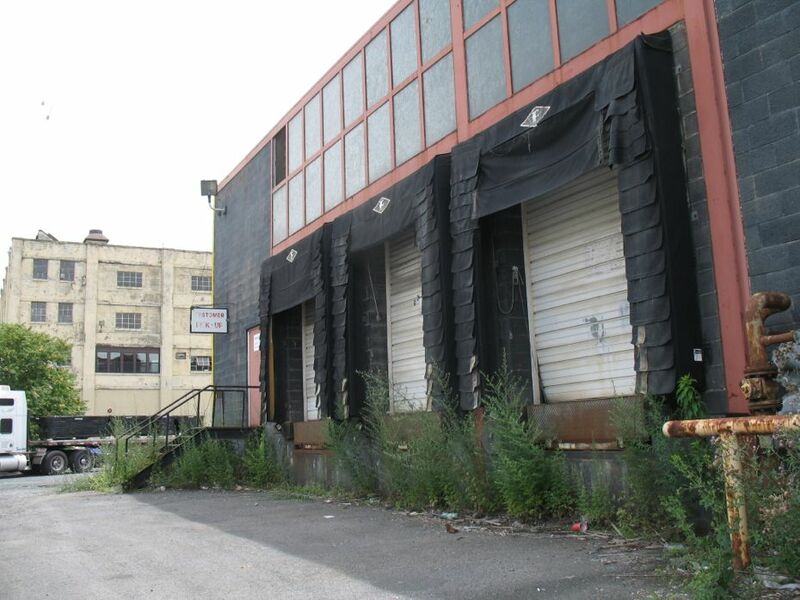 And Matt Baumgartner, a savvy business person with a track record of being able to see potential, has been touting the area for the last few years (not to mention that he's invested there via Wolff's and Sciortino's). Residential is something largely not present in the neighborhood at the moment (though there is some). 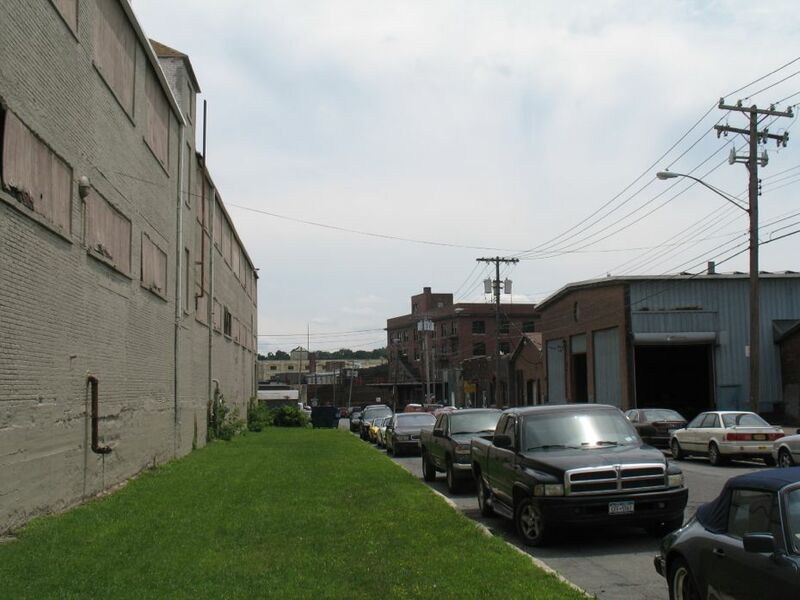 But one of the consultants working on the Impact Downtown Albany plan said last November that 1,000 residential units in the neighborhood looked like something that might be possible. The talk about the residential/restaurant/retail-type potential of the neighborhood is a little bit funny, though, because the current vibe of the neighborhood is very much not that. 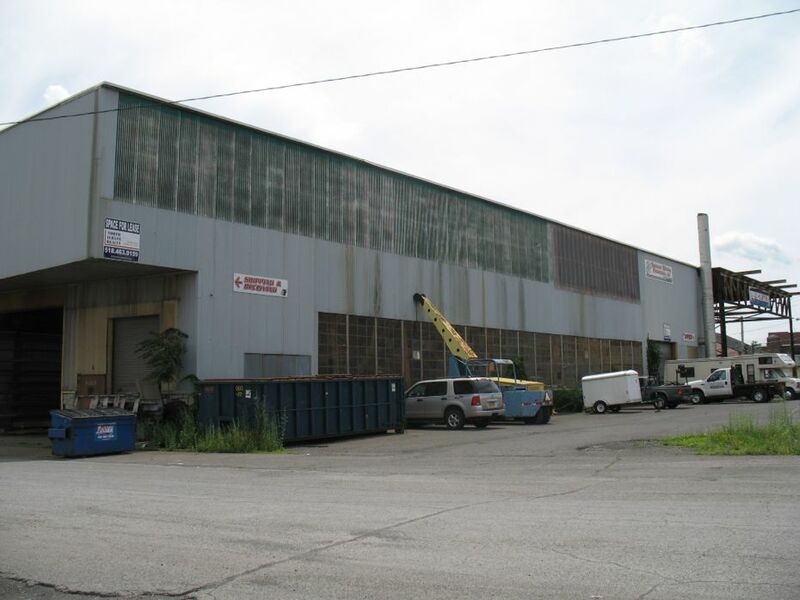 The area is full of light industrial and related service businesses: stone cutters, auto shops, moving and storage companies. At the same time, a walk through the neighborhood makes its potential a bit more clear. The buildings and blocks have a really nice, welcoming scale. The landscape is flat. And there's a big enough area to potentially pack in a lot of different types of uses without the neighborhood feeling too cramped. 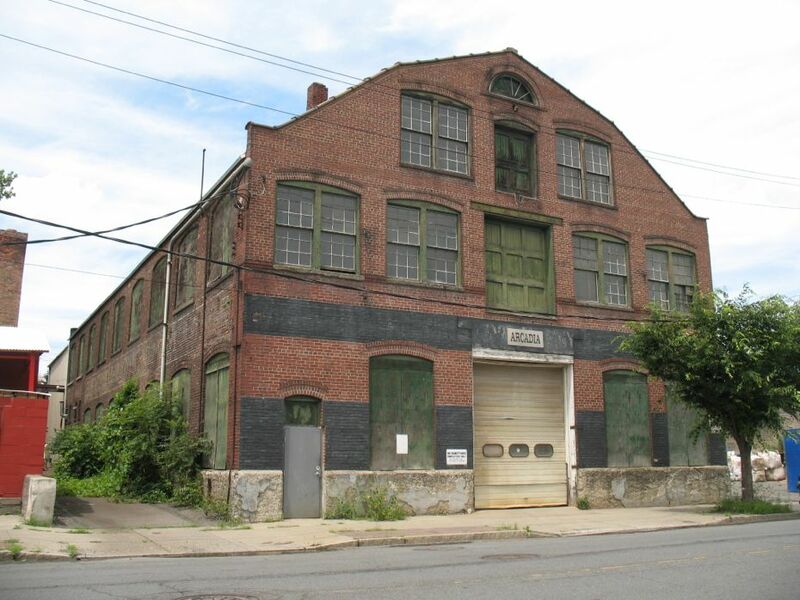 And there are some good reasons a city and/or property owners might encourage such a flip, maybe the foremost being that many old industrial buildings are no longer suited to be industrial buildings. 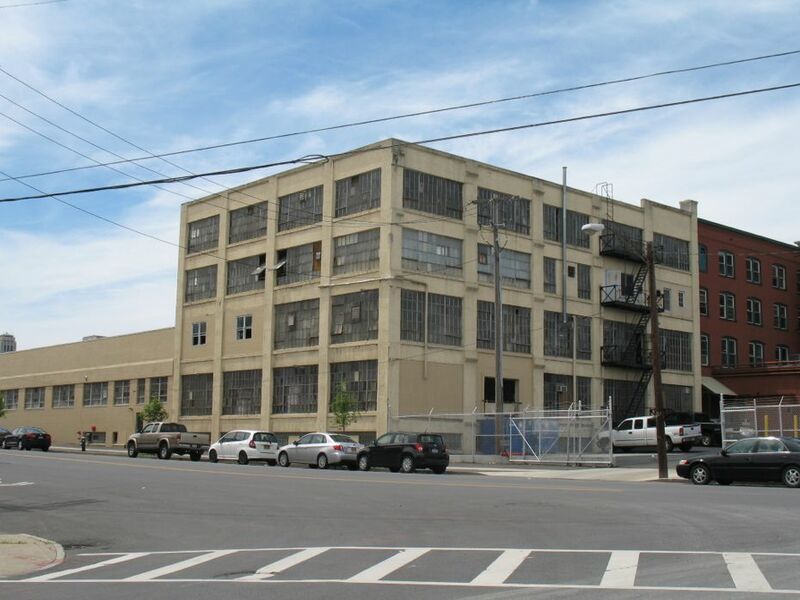 What made old industrial buildings useful in their time -- multiple levels, relatively narrow floor plates, lots of windows for light -- now make them not useful for modern industrial processes. But it makes them potentially attractive for other purposes, residential especially. 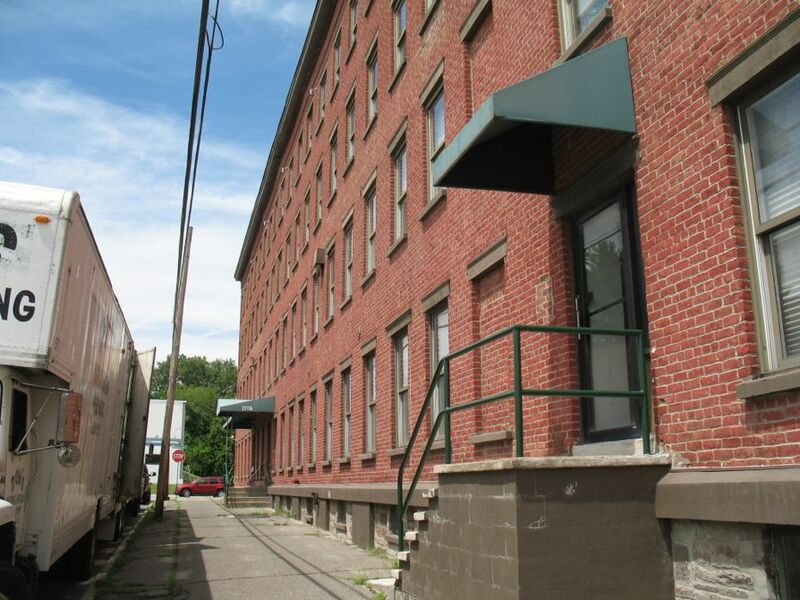 The Harmony Mills buildings in Cohoes are a good example. 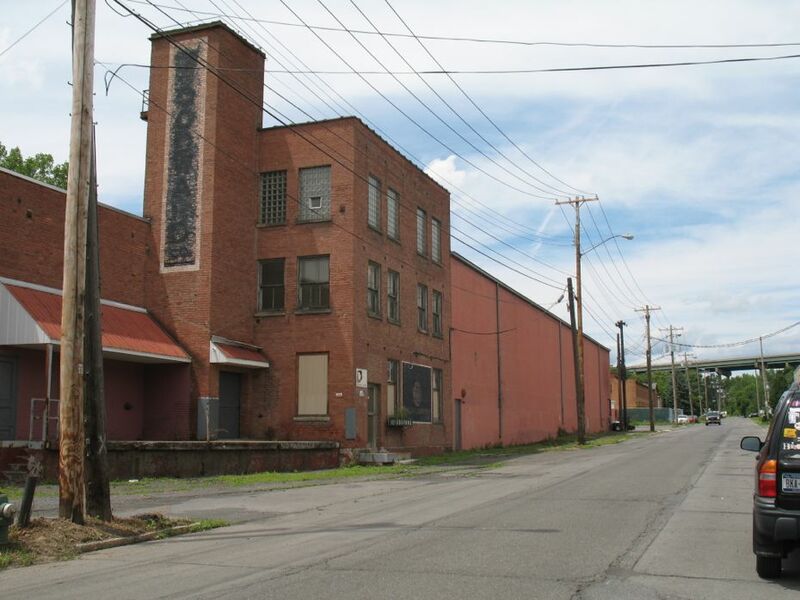 They were once one of the nation's most high-tech factories -- in the 1860s. 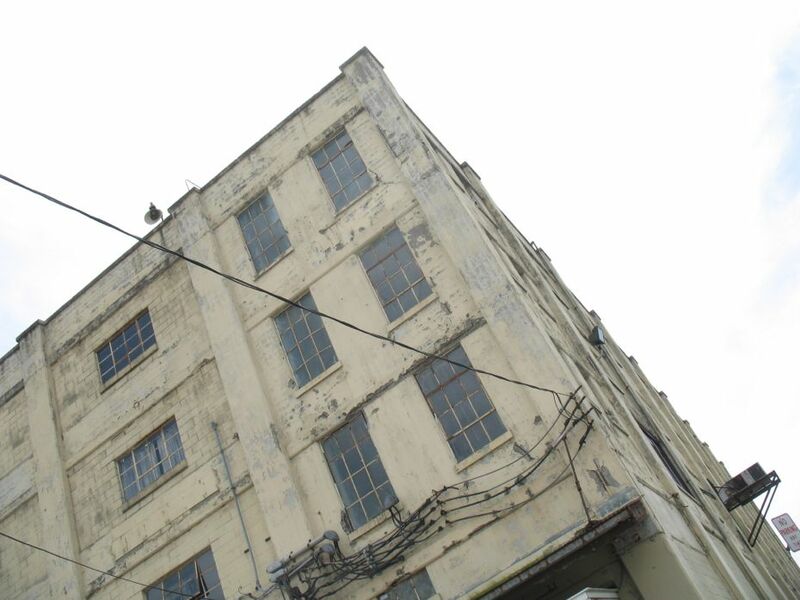 But the buildings are unsuitable for modern manufacturing. They seem to have worked out well as apartments, though. 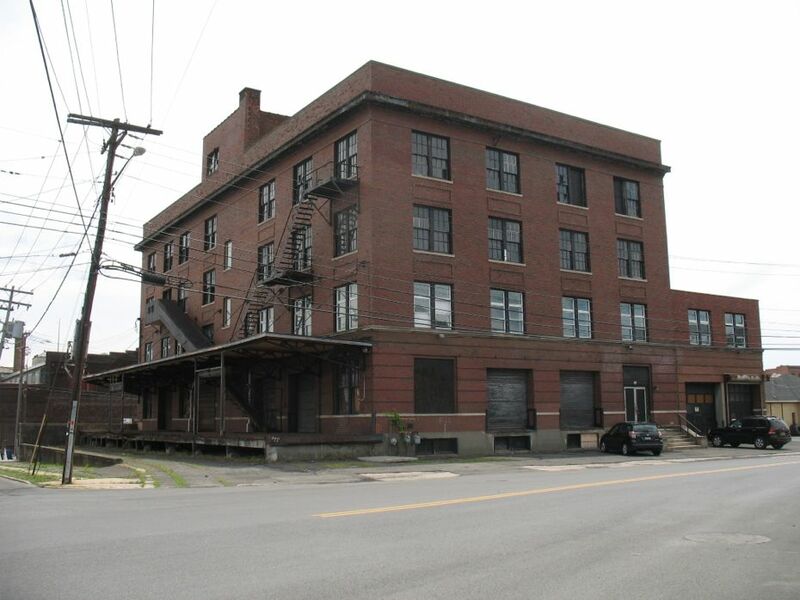 Downtown Albany is another example of buildings not meeting the modern needs of their original purpose -- though in that case it's offices instead of industrial. 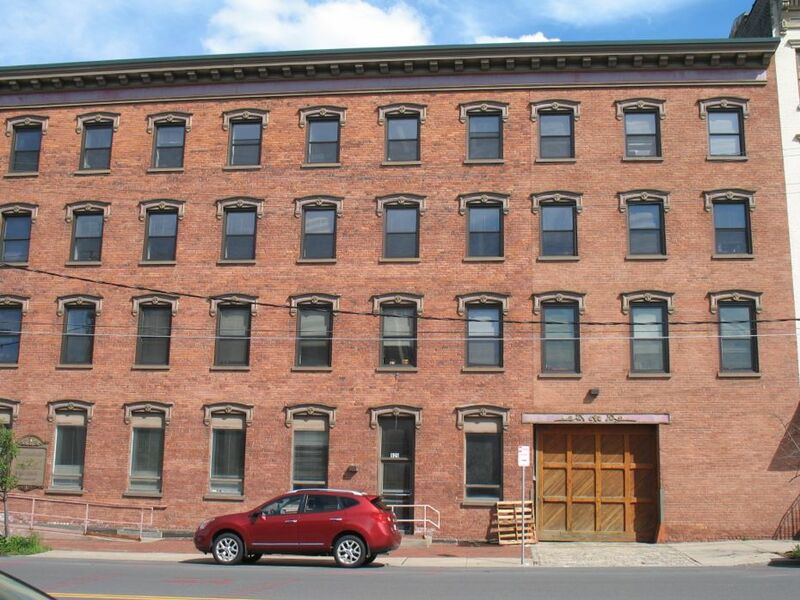 But again, those old buildings appear to make good apartments. 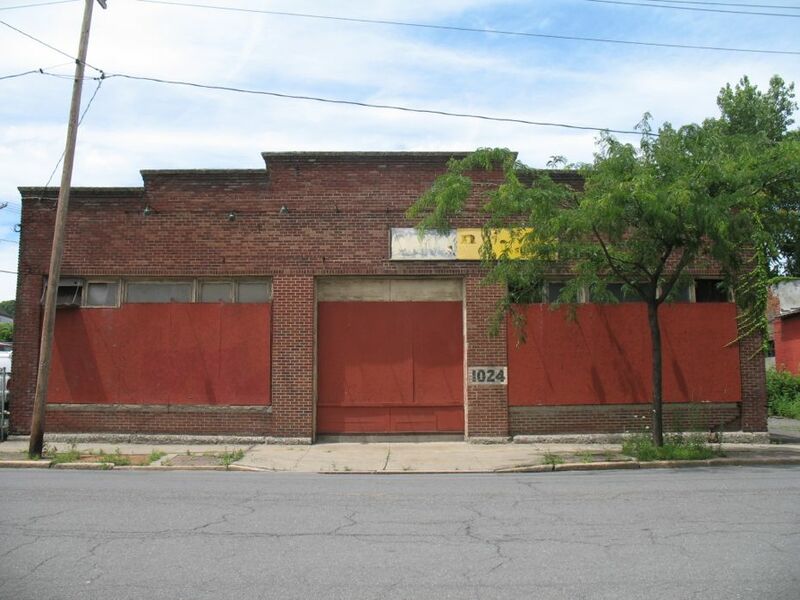 So, residential/restaurant/entertainment/retail/whatever could be a good next life for vacant or underused building stock in this neighborhood. The Adam Ross Cut Stone business dates back to 1889. Just because this neighborhood could potentially flip to a more residential state doesn't necessarily mean that it should. 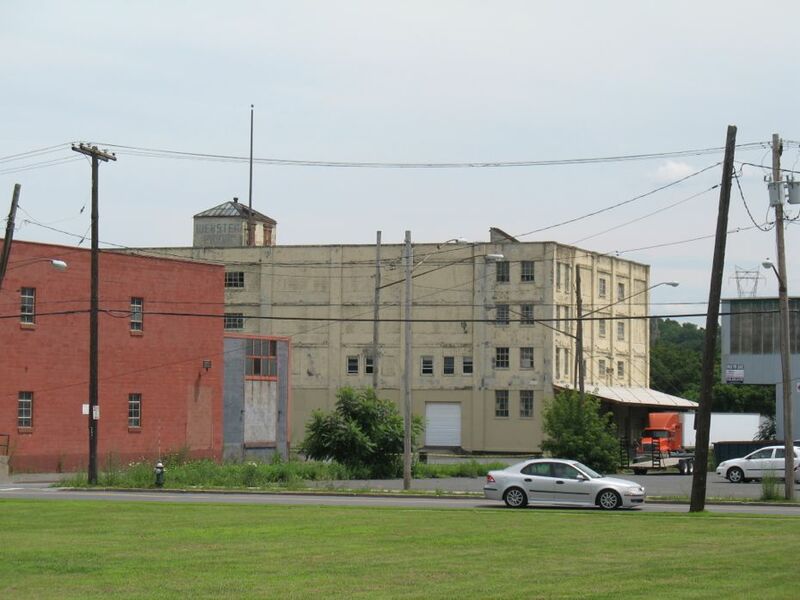 This general area has a long history of industrial-type uses. And there are currently many businesses operating in the neighborhood. Presumably they're there because the site works for them. 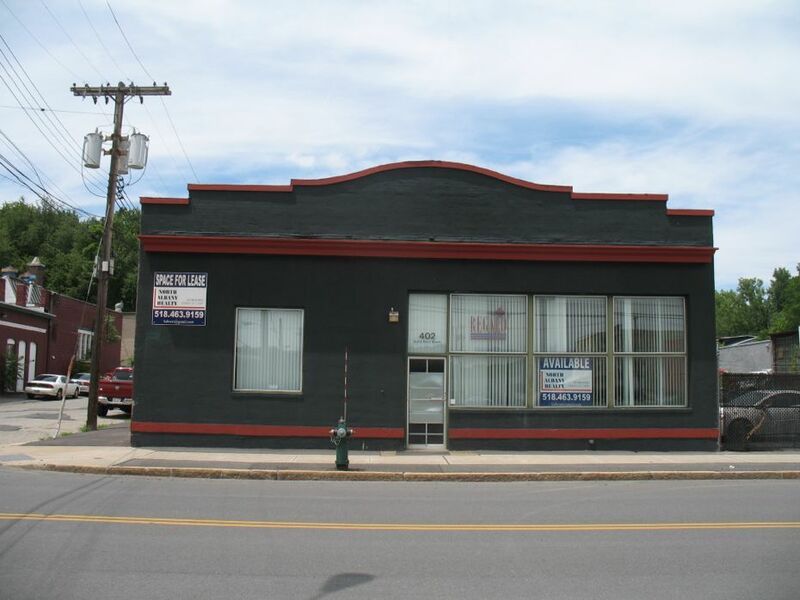 (In fact, one of the city's oldest businesses is currently located on Broadway right near Nipper.) These businesses are jobs and tax base. 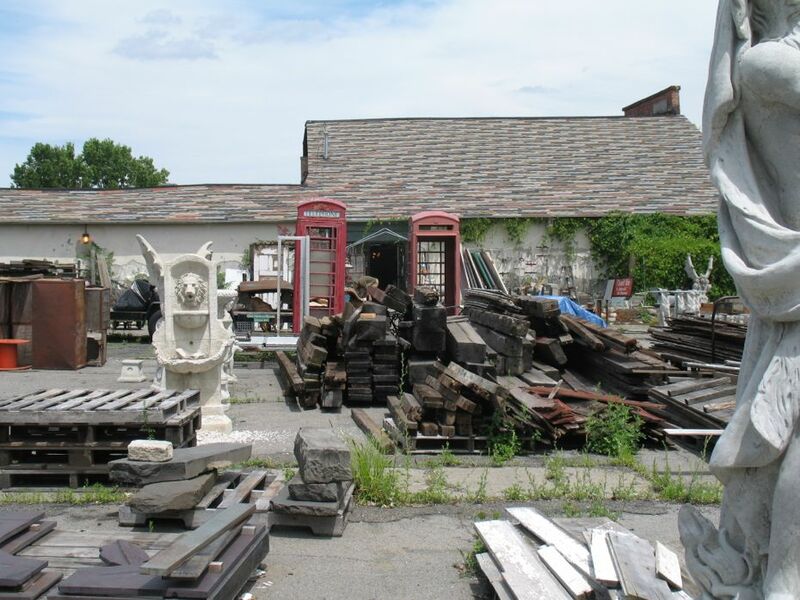 They shouldn't necessarily be chased out just because of some desire to create a DUMBO for Albany. If the neighborhood does continue to move toward a more residential-type state, there's bound to be friction. Because residential (pedestrians, parking demand, people wanting to sleep) doesn't necessarily pair well with industrial (big trucks, loud noises). 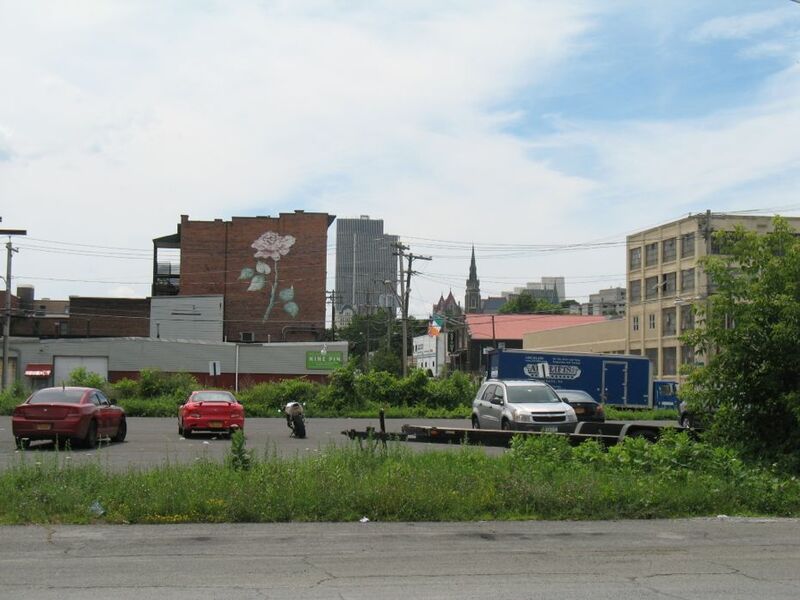 So the situation could prompt some interesting questions for the city, because it will have a role to play with regard to zoning and variances. 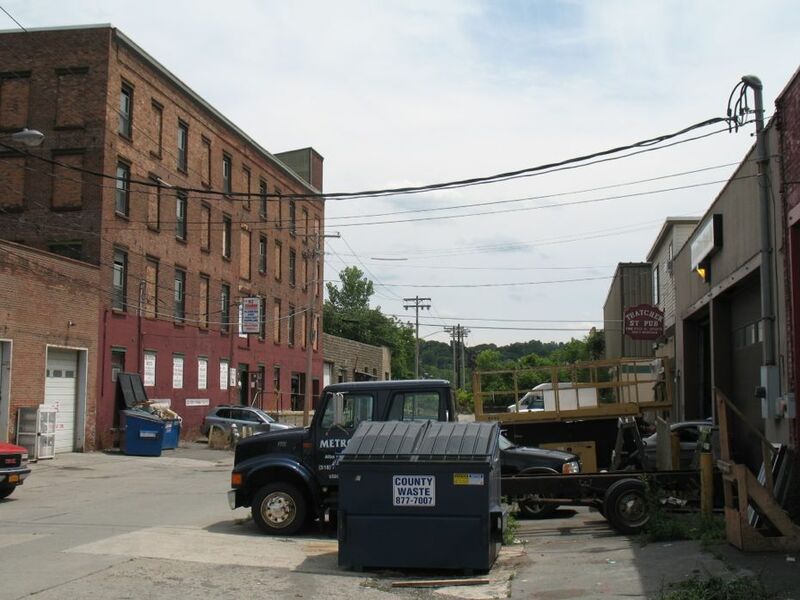 Just last year the Board of Zoning Appeals rejected a variance request from a project -- a music venue -- that would have pushed the neighborhood more in the direction of entertainment and residential. If momentum continues to carry the neighborhood in its current direction, the city will face more of those choices. 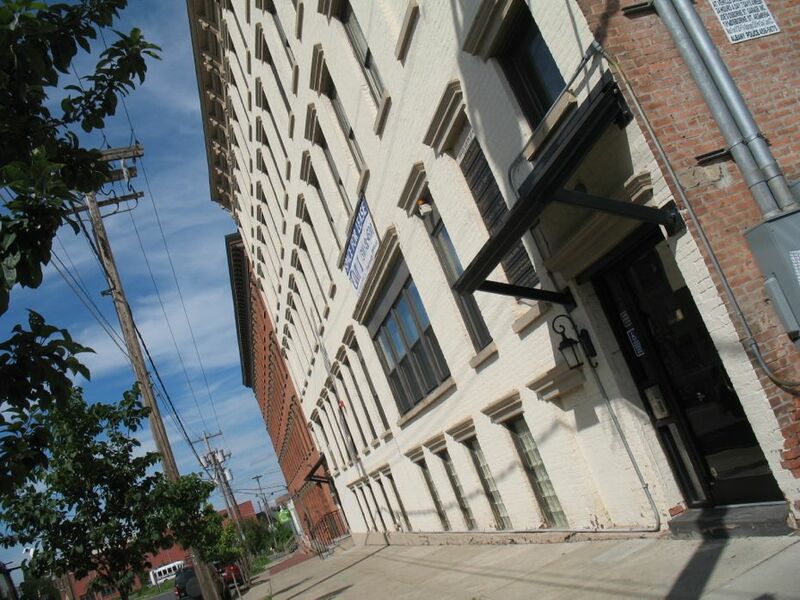 This is probably my favorite area of Albany, especially the Argus Press building. 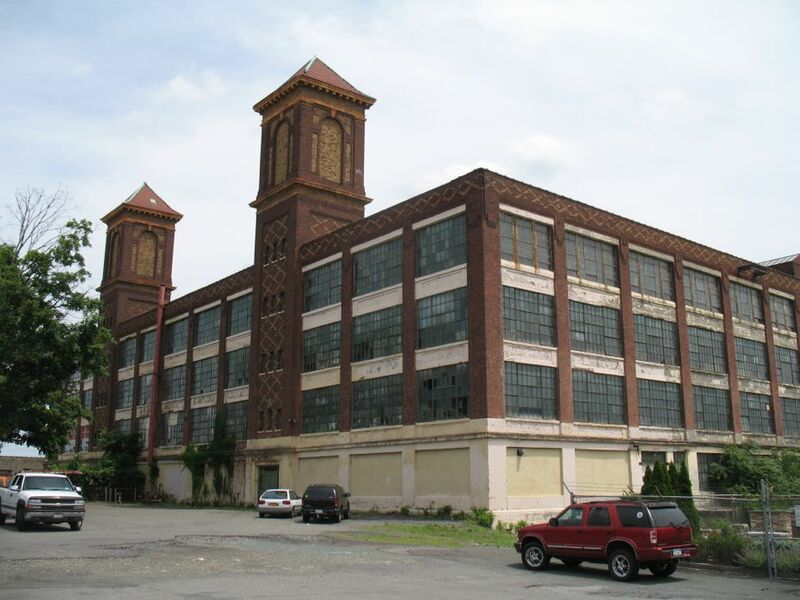 It's heartening to see that the neighborhood is seeing early stages of revival - I think a lot of cities are starting to realize the potential and charm of historic warehouse and factory buildings. I'm sort of conflicted because although I want to see them all saved, I like the sort of gritty time-worn quality of peeling paint, dirty brick, and faded signage. 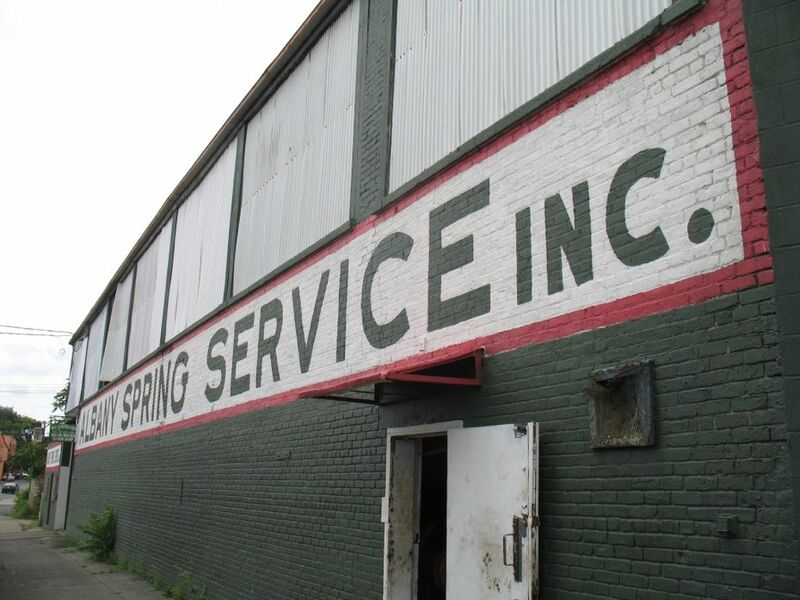 It's like the controversy over what to do with ghost signs in downtown Albany a few years back - it seemed wrong to repaint them all like they were new but so did letting them all fade away into nothing. If only there was a way to preserve the weathered, beaten look to all these buildings without letting them deteriorate further. Andy: I like those two buildings too....the Arcadia building has a real dutch feel to it. 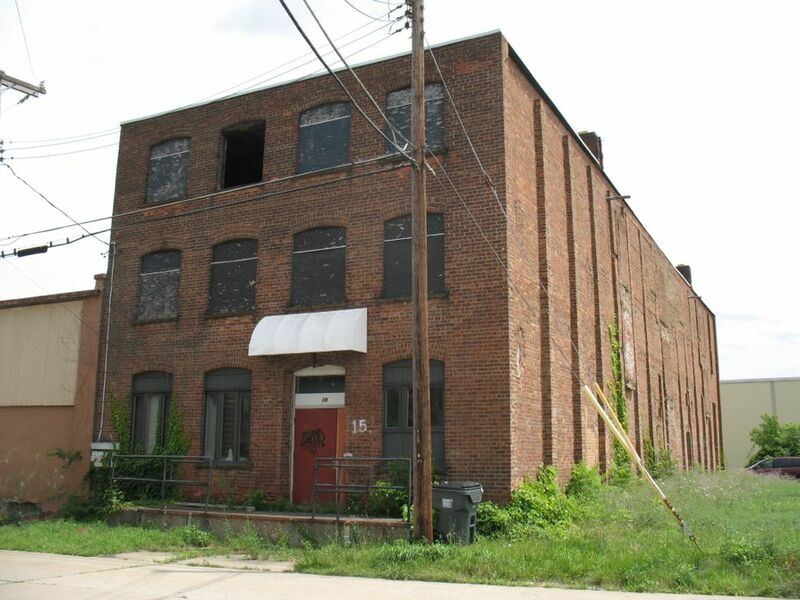 IMO this warehouse district has great potential for both residential and commercial use, but it will take some leadership and innovative thinking...to somehow "grandfather in" the existing businesses so their locations (and jobs) are preserved. 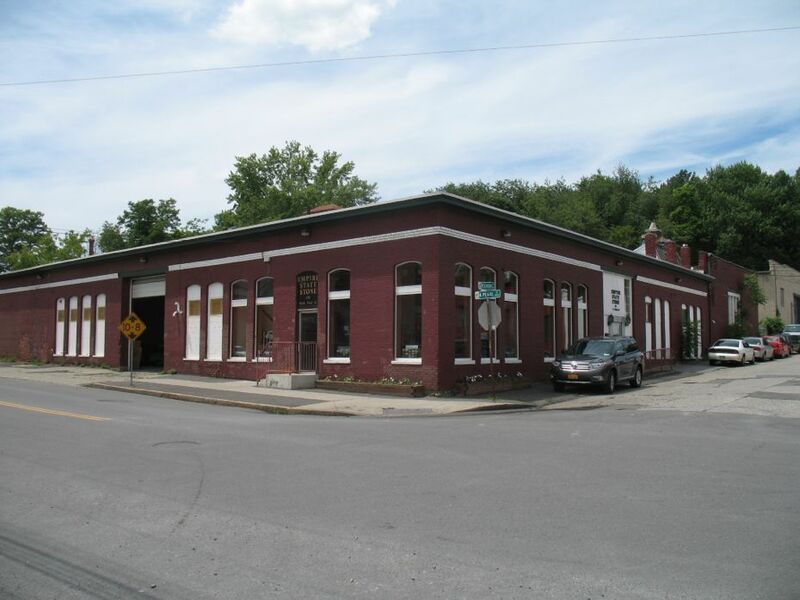 (one can imagine that property taxes will skyrocket if this district takes off---probably driving out the businesses) and to actively develop the area (rather than Albany's current "wait and see" attitude). Lastly I wonder how "clean" these industrial site are.....is there a DEC history with any of them? what sort of clean up would be needed to get them ready for residents? AllOverAlbany: Thanks for the photos and the forum!! 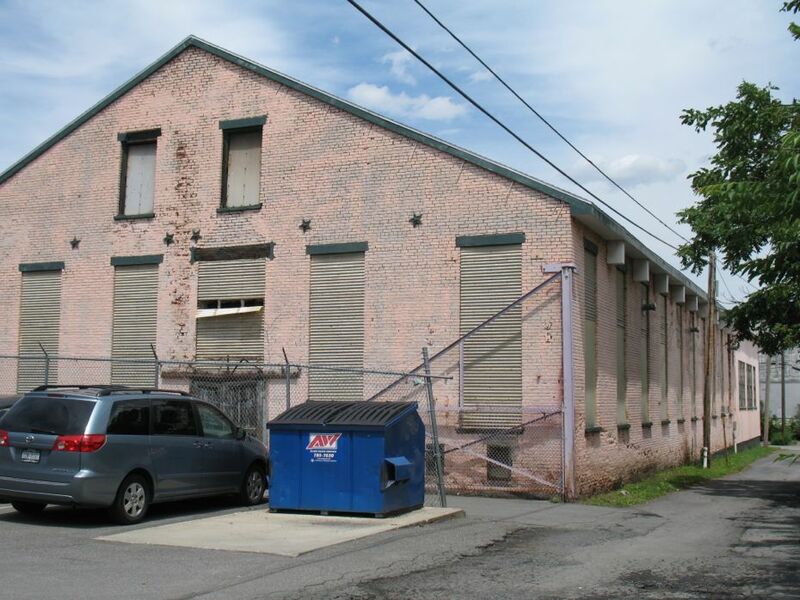 I'm glad you noted the proposal for a (medium-sized) showcase music venue for the building on Thatcher Street in the district. New brewery/craft beer and cidery businesses are ok, but a use such as this would not? 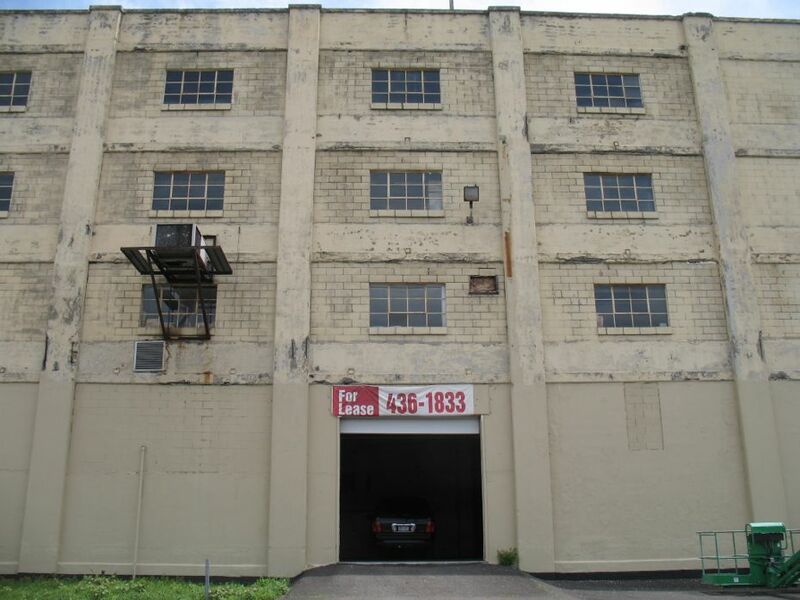 Perhaps one of the other buildings in the district would be a better fit than the originally proposed location. 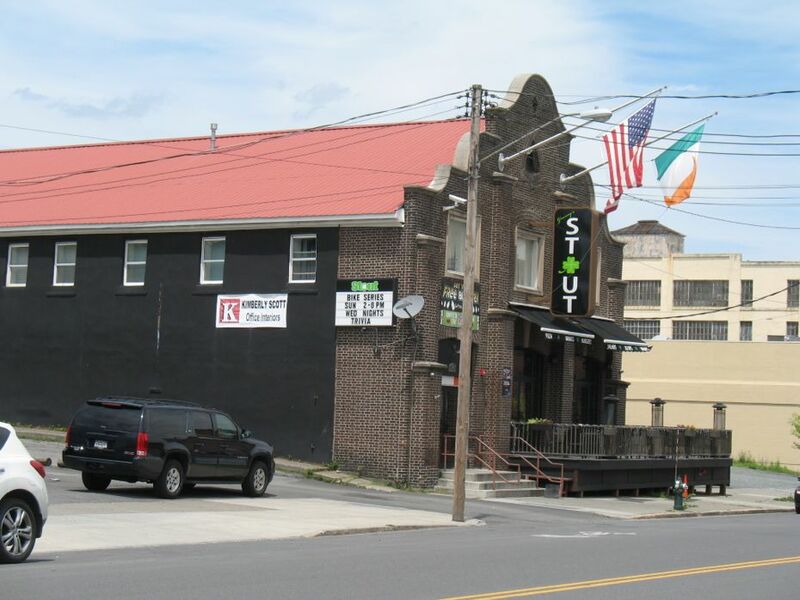 With Valentine's gone, Albany needs a venue that would be attractive to up-and-coming artists and provide a larger stage for our own bands and musicians. Hi, I just have to say that I absolutely love Albany! 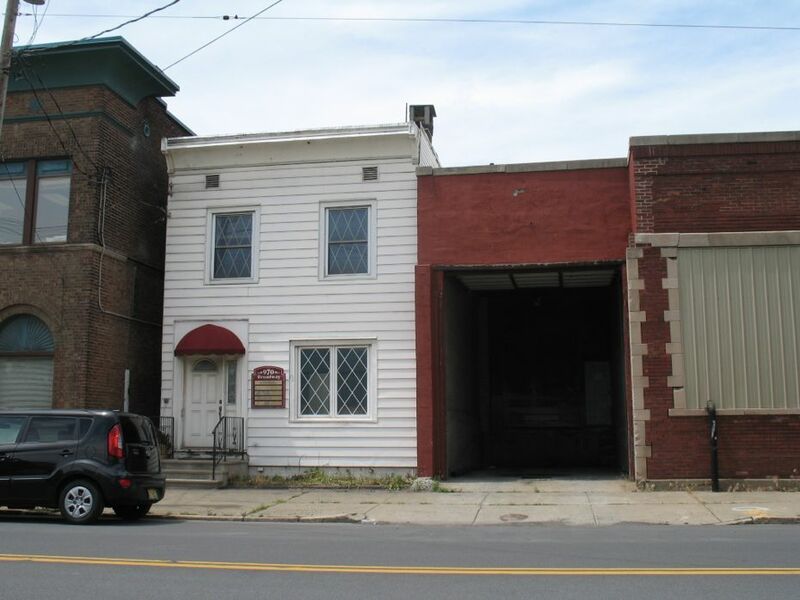 I was born in Albany in 1942 and grew up in the same house that my mother did on Bradford St. My grandfather owned the house and he too had been born in Albany. He peddled vegetables. I remember the rag man, the Freihofer man coming to my house to deliver bread, those yummy chocolate chip cookies and the Freddy Freihofer show on television. I actually was on the Freddy Freihofer show once for my birthday. I think that I was about 8years old at the time. It was so much fun! 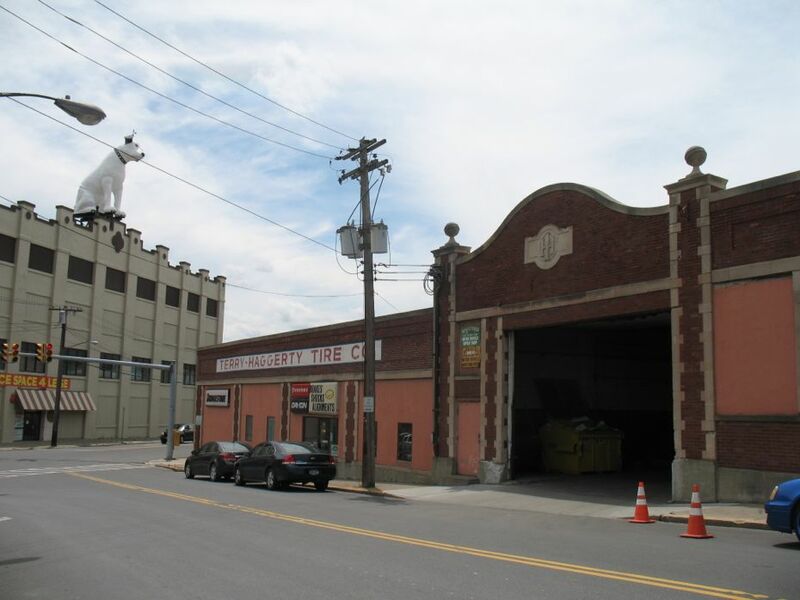 I also remember the car barns on the corner of Quail St. and Bradford St. 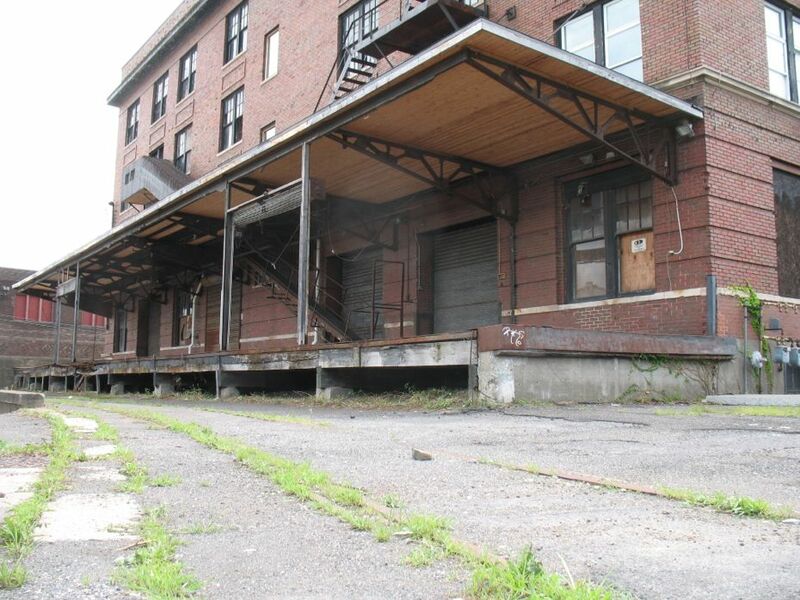 The trolley tracks ran right into the building where the trolley's where housed at night. The holidays were great in Albany. Halloween was so much fun. The businesses on Central Av. allowed people to paint pictures on the storefront windows and a committee would walk around the Avenue and judge the pictures. 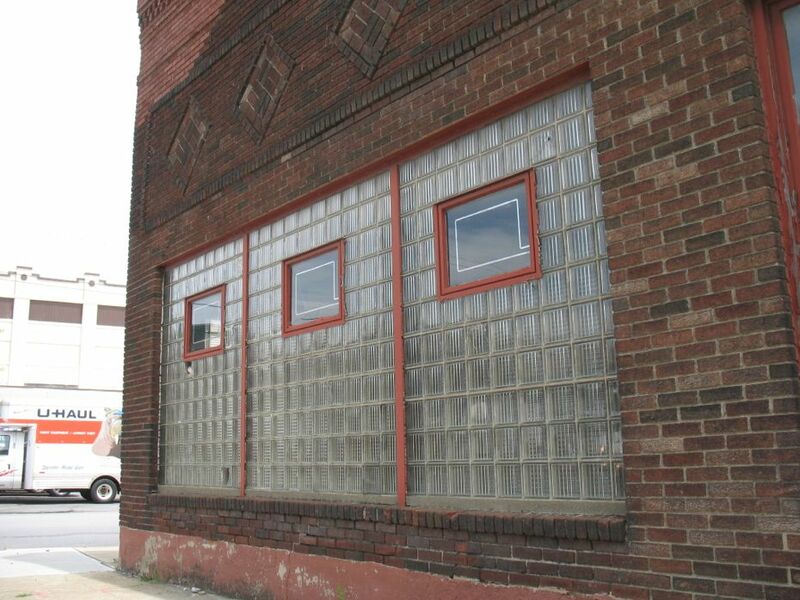 I remember I painted a picture on the Sherwin Williams storefront window and won second prize. At Christmas time Central Ave. was a wonderland with Christmas lights strung across the street all the way down to Henry Johnson Blvd. The schools were great. I went to school 10, Livingston and Albany High. The one thing that I remember is that my friends were of all color, races and religions. I never knew anything about segregation or racial issues. When there were problems all around the country it didn't happen in Albany. Mayor Corning sent the National Guard out to major highways coming into the city to keep trouble makers from coming in and starting problems. School and work went on as usual and all of us kids continued to get along as usual. When I graduated from Albany High Archie Goodbe was our class president! When I mention that to people now they are amazed. We loved that guy. The other great influence in my life was my church and all of the other churches on Central Ave. I grew up in St. John's Lutheran Church on Central Ave. but attended Our Lady of Angels and St. Patrick's on Central Ave. My father would take us to various churches growing up so that we would see what they were like. I always loved Our Lady of Angels. I loved the way it looked with all of the candles, the beautiful statues and the warm feeling that I got when I went to light a candle. I am saddened that so much has been lost to history and to memories. These memories need to be preserved and held tightly in loving arms. My wish is that some of these old wonderful ways would come back for the kids to experience. What about having some kind of art contest for Halloween again, or more lights again or one big block party on Central Ave? troop. My friend still lived there but wasn't home. I did get to see her daughter , the mother of my G.S. I cried tears of joy finding friends from the past. As we drove away I just sobbed. My husband had to pull over because I was crying so hard. I felt as if the emptiness that I felt was filled again with the reuniting of friends of the past. As different as we are we are family. Since I have been married I have lived in Altamont raising my children, being involved in Girl Scouts there as well as in Albany. I didn't realize it until today that my heart belongs to Albany. In my hallway I have many pictures of the city as well as Altamont. 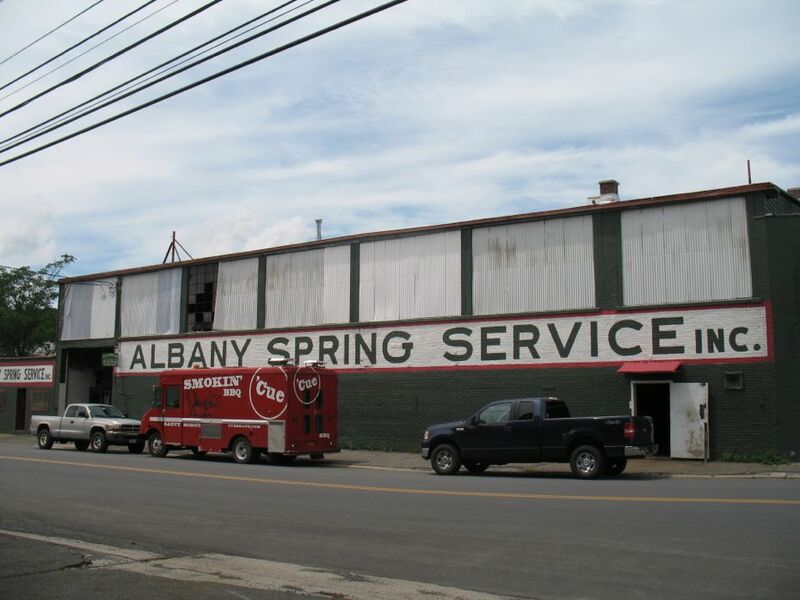 Thank you all for caring about Albany and please take good care of it. It is a wonderful treasure. I will again be working with Girl Scouts again downtown. I may be on the older end of the spectrum now but look out for me. 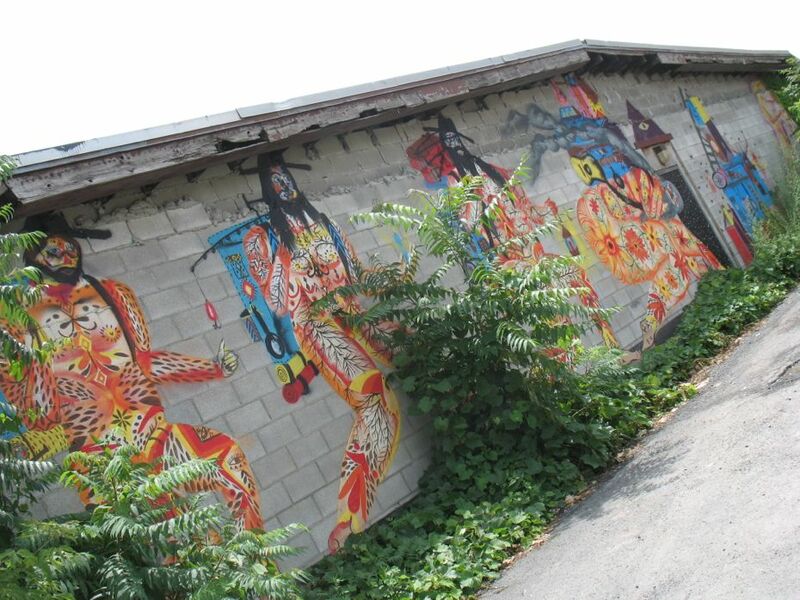 I hope we meet some day as I travel around Arbor Hill and North Albany with a gaggle of Girl Scouts behind me.